Woolworths has launched a new collectables promotion to help win back your supermarket loyalty this Christmas. ‘Woolworths Christmas Pop-Outs’ will be available from this Wednesday (14 November) and feature 12 Christmas-themed buildable cardboard characters. Customers will receive one for every $30 they spend on eligible purchases in store or online. Characters include Santa, Reindeer, Elves, Gingerbread Man, Snowman and more, with the full range boasted to be made in Australia from recyclable paper. Three characters will be released each week over the four weeks of the promotion. The pieces “pop out” from the cardboard frame and can be assembled using the instructions at the bottom of the board or online. For an additional $3, collectors can buy a Christmas Tree Stand to house the characters. Woolworths Supermarkets Managing Director, Claire Peters, said in a statement: “We are really excited to be able to offer Australian families a small gift that captures the fun, imagination and festive spirit of the season with the Woolworths Christmas Pop-Outs. “We believe that kids, parents, grandparents and individuals will be captured by the wonder and imagination of the range and will find ways to make them their own this Christmas — whether that’s as a place card for the dining table or an additional festive ornament around the Christmas tree. The first three collectables to be released are ‘Joy’ the Clever Elf, ‘Twinkles’ the Christmas tree and ‘Snowflake’ the Reindeer. The Woolworths Christmas Pop-Outs promotion is a not-so-subtle answer to Coles Little Shop, with the supermarket giant stating “customers will also be able to see what they are getting as the ‘Woolworths Christmas Pop-Outs’ will not come in ‘blind plastic bags’ to help avoid duplication or disappointment and minimise waste”. Woolworths has previously had success with its animal cards and Marvel superhero discs collectables. However, earlier this year Chief Executive Brad Banducci admitted that it was tough going without one when a competitor program like Little Shop was so successful. 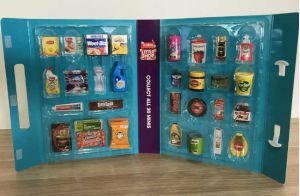 For every $30 spent at Coles, shoppers received one miniature collectable of big name brands including Weet-Bix, Tim-Tams, Milo, Nutella, Colgate and many more. There were 30 miniature items to collect, with Coles also hosting a swap day to provide a forum for shoppers to trade their collectables and help them complete the full set. Coles has indicated that Little Shop will return in 2019, according to news.com.au. In a recent Canstar Blue survey, one in five adults (22%) admitted that supermarket promotions like Coles Little Shop have an influence on where they do their shopping. A similar number (21%) admitted they are likely to spend more on their shopping because of them.